Start off your visit on the 4th (Mon): tour in harmony with nature at Big Mama Sailing, then stroll through Geoffrey Bay, and then admire all the interesting features of Magnetic Island Forts Walk. Keep things going the next day: cast your line with a fishing tour, then kick back and relax at West Point, and then get engrossed in the history at Magnetic Island Museum. For photos, maps, where to stay, and other tourist information, you can read our Magnetic Island holiday planner . Cairns to Magnetic Island is an approximately 4.5-hour combination of flight and ferry. You can also do a combination of car and ferry; or do a combination of bus and ferry. In February in Magnetic Island, expect temperatures between 37°C during the day and 28°C at night. Wrap up your sightseeing on the 6th (Wed) early enough to travel to Agnes Water. On the 6th (Wed), pause for some photo ops at Lieutenant James Cook Monument Cairn and then look for all kinds of wild species at Paperbark Forest Walk. Here are some ideas for day two: kick back and relax at Agnes Water Main Beach, then sample the fine beverages at 1770 Distillery, and then head off the coast to Lady Musgrave Island. To find ratings, more things to do, traveler tips, and tourist information, use the Agnes Water trip planner . Use the Route module to find suitable travel options from Magnetic Island to Agnes Water. In February, daytime highs in Agnes Water are 36°C, while nighttime lows are 26°C. Wrap up your sightseeing on the 8th (Fri) to allow time to travel to Fraser Island. Start off your visit on the 9th (Sat): contemplate the waterfront views at Lake McKenzie and then enjoy the sand and surf at Seventy-Five Mile Beach. On the 10th (Sun), you'll have a packed day of sightseeing: enjoy the sand and surf at Eli Creek. To find maps, reviews, ratings, and tourist information, read Fraser Island road trip planning tool . The Route module can help you plan travel from Agnes Water to Fraser Island. Expect a daytime high around 35°C in February, and nighttime lows around 24°C. Wrap up your sightseeing by early afternoon on the 10th (Sun) to allow enough time to travel to Rainbow Beach. Rainbow Beach is a coastal town in the Wide Bay–Burnett region of Queensland, Australia, east of Gympie. On the 11th (Mon), look for all kinds of wild species at Barnacles Dolphin Centre, then explore the activities along Searys Creek, and then take in the dramatic natural features at Carlo Sand Blow. Keep things going the next day: enjoy the sand and surf at Rainbow Beach. For traveler tips, ratings, photos, and more tourist information, go to the Rainbow Beach trip itinerary builder website . The Route module can help you plan travel from Fraser Island to Rainbow Beach. 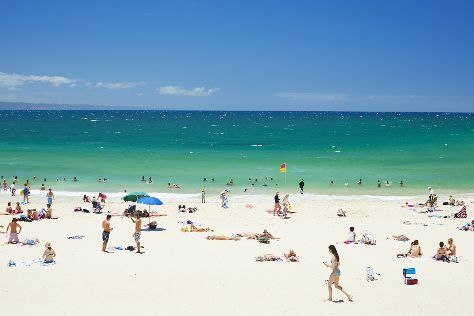 Wrap up your sightseeing by early afternoon on the 12th (Tue) to allow enough time to travel to Noosa. Keep things going the next day: enjoy the sand and surf at Peregian Beach, then take a stroll through Hastings Street, and then tour the pleasant surroundings at Noosa Main Beach. To find maps and tourist information, read our Noosa day trip planning site . Traveling by car from Rainbow Beach to Noosa takes 1.5 hours. Wrap up your sightseeing on the 15th (Fri) to allow time to drive to Mooloolaba. On the 15th (Fri), step into the grandiose world of Sunshine Castle, then view the masterpieces at Atrium Gallery at Buderim Craft Cottage, then stroll through Bulcock Beach, and finally kick back and relax at Kings Beach. On the 16th (Sat), you'll have a packed day of sightseeing: examine the collection at Queensland Air Museum, then take in the exciting artwork at Art on Cairncross, and then enjoy the sand and surf at Maroochydore Beach. To see maps and tourist information, read Mooloolaba trip planner. You can drive from Noosa to Mooloolaba in an hour. Alternatively, you can take a bus; or do a combination of train and bus. 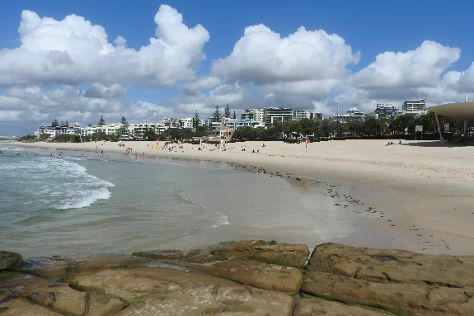 February in Mooloolaba sees daily highs of 33°C and lows of 24°C at night. Cap off your sightseeing on the 16th (Sat) early enough to go by car to Gold Coast. We've included these beaches for you: Surfer's Paradise Beach and Burleigh Heads Beach. Get a sense of the local culture at Bunjurgen Estate Vineyard and Ripley's Believe It Or Not! Surfers Paradise. Next up on the itinerary: find something for the whole family at Sea World Theme Park, enjoy breathtaking views from SkyPoint Observation Deck, tour the pleasant surroundings at Coolangatta Beach, and visit a coastal fixture at Captain Cook Memorial and Lighthouse. Traveling by car from Mooloolaba to Gold Coast takes 2 hours. Alternatively, you can take a bus; or do a combination of bus and train. 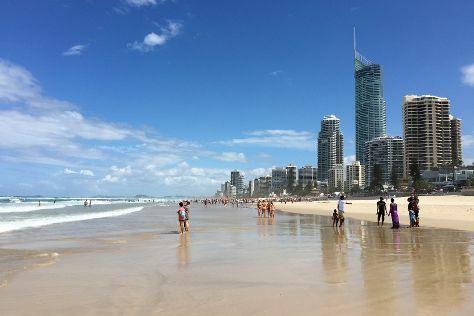 In February in Gold Coast, expect temperatures between 32°C during the day and 24°C at night. Cap off your sightseeing on the 20th (Wed) early enough to catcht the bus to Byron Bay. On the 21st (Thu), relax in the rural setting at The Farm Byron Bay, then stroll through Lennox Head Beach, then enjoy the sea views from Cape Byron Lighthouse, and finally soothe aching muscles at some of the top local wellness centers. Get ready for a full day of sightseeing on the next day: take in the exciting artwork at Tweed Regional Gallery & Margaret Olley Art Centre, enjoy the sand and surf at Belongil Beach, and then trek along Cape Byron Walking Track. To see photos, maps, ratings, and more tourist information, go to the Byron Bay day trip tool . Traveling by bus from Gold Coast to Byron Bay takes an hour. Alternatively, you can drive. In February, plan for daily highs up to 34°C, and evening lows to 21°C. Wrap up your sightseeing on the 23rd (Sat) to allow time to travel to Palm Beach. Kick off your visit on the 23rd (Sat): enjoy the sea views from Norah Head Lighthouse, head outdoors with The Entrance Pelican Feed, and then kick back and relax at Palm Beach. Here are some ideas for day two: wander the streets of Whale Beach, enjoy the sand and surf at Terrigal Beach, and then see the interesting displays at Gosford Classic Car Museum. To find reviews, photos, where to stay, and more tourist information, read Palm Beach holiday app . You can drive from Byron Bay to Palm Beach in 9 hours. Another option is to fly. Expect a daytime high around 31°C in February, and nighttime lows around 23°C. Cap off your sightseeing on the 24th (Sun) early enough to travel to Sydney. 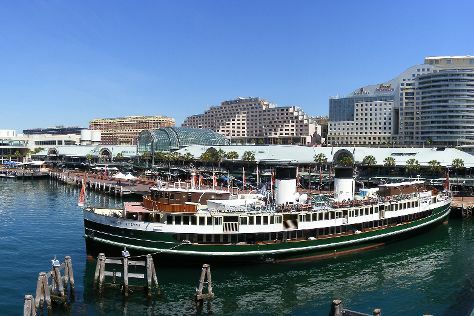 Start off your visit on the 25th (Mon): take a stroll through Darling Harbour, then see a show at Sydney Opera House, and then take a stroll through The Rocks. Keep things going the next day: stroll through Manly Beach, then enjoy the sand and surf at Clovelly, and then enjoy the sand and surf at Bondi Beach. For ratings, maps, other places to visit, and other tourist information, read our Sydney holiday tool . You can drive from Palm Beach to Sydney in 1.5 hours. In February in Sydney, expect temperatures between 31°C during the day and 23°C at night. Wrap up your sightseeing on the 26th (Tue) early enough to travel to Bondi. Start off your visit on the 27th (Wed): steep yourself in history at Vaucluse House, then get great views at North Bondi Lookout, then tour the pleasant surroundings at Maroubra Beach, and finally enjoy the sand and surf at Bronte Beach. Get ready for a full day of sightseeing on the next day: explore the world behind art at Norman Lindsay Gallery & Museum, get your game on at iFLY Downunder, and then enjoy the sea views from Wollongong Head Lighthouse. To see more things to do, where to stay, ratings, and more tourist information, use the Bondi trip itinerary planner . Bondi is just a short distance from Sydney. In February, daytime highs in Bondi are 31°C, while nighttime lows are 23°C. Wrap up your sightseeing by early afternoon on the 1st (Fri) to allow enough time to travel back home.